Remote Control Functionality – There is also more below in our review of the app and the interfaces. Which are the most areas of application? The GLM 100 C works with R60. This combination transforms the laser distance measure into a digital level. R60 is an aluminum construction of high quality —It includes two bubble level vials for best accuracy and also for additional reference. Due to the aluminum of the R60 the Bluetooth antenna of the GLM 100 C doesn’t work properly. Bluetooth in rangefinders cannot be used, if the manufacturer does not prepare the appropriate software for external devices (tablets, smartphones, laptops). Wireless transmission of real-time data from the measuring instrument to a cellphone or a tablet is the main function of bluetooth. The application GLM measure & document can be downloaded in the version for Android from Google Play Store and for iOS from the App Store. Well, let’s go! The most important function for the rangefinder Bosch GLM 100 C is, of course, keeping a digital sketch of the measured object. The camera and touchscreen of a smartphone or tablet are used instead of paper and a pencil. 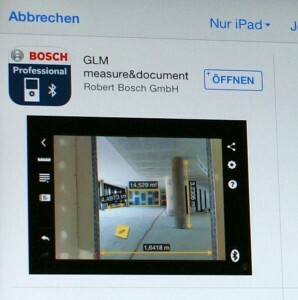 After the application is installed on the smartphone or in our case an iPad tablet we establish a Bluetooth connection with the Bosch rangefinder. Then start a new project by giving basic information about the investor, address, and so on. Then you can choose between a photo stored in the phone memory or a new image, which immediately can be taken with the built-in digital camera. On the picture we can apply three types of graphic elements – lines, surfaces (rectangles) and angular elements. You can edit the length of the line, by pulling the appropriate end, and by choosing the color. As you probably noticed, descriptions from the laser distance measurer have a different font color than manually entered ones. In addition to the created documentation we can attach text notes and voice that facilitate the subsequent design work. Let us return for a moment to the menu with the measurements of the project. Appear there all the values that were put on the sketch in the project, but also the values previously measured in all the sketches (tab General Measurements). By clicking the icon in the top bar calculator, you can perform mathematical operations on the measured values and calculate the circumference measured eg windows. If sketching is finished it is time for transmitting the results. The measurement data can be sent by e-mail to the office, where colleagues can immediately be addressed for further data processing. The user can send JPG files of the sketch, or PDFs including the sketch and summary of the measured values. The automatic transmission of measurements via Bluetooth is very nice. The operator does not need to press any buttons – the result alone appears on the screen recorder. The new laser rangefinder Bosch GLM 100 C also allows you to send messages via Bluetooth from the controller (in our case an iPad) to the rangefinder. This means that the measuring instrument can be controlled remotely. These applications of the GLM measure & document app are quite well developed, though, there is still room for improvement. The user can not only trigger virtually any measurement function from the iPad (length, area, volume, angles, indirect measurements), but also set the parameters of the measuring instrument (for example, change the reference point of measurement on the instrument). All measured values are stored in the project measurements. Remote control rangefinder Bosch GLM 100 C allows you to efficiently lead single measurements – either linear (length) or angular (tilt of structures). 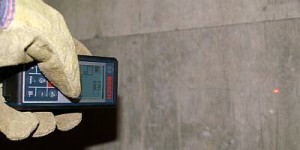 For monitoring the size and shape of buildings and industrial applications it would definitely be of high value if the laser distance measurer could trigger cyclic measurements of a defined interval. There has been an update of the “GLM measure&document” app at June 2nd 2014. The update allows the export of measurements in MS-Excel data format. There are also further improvements and small bugs got deleteted. There is a new additional app called “GLM floor plan“. The following requirements must be fullfilled: Bluetooth is needed: Android devices need Bluetooth 2.1 and Bluetooth 3.0 iOS devices with Bluetooth© Smart technology.Android tablets with Android 4.x.x or higher are supported. iOS: iPad (3rd gen.), iPad (4th gen.), iPad Air, iPad mini and iPad mini Retina work with the app GLM floor plan. What are the main advantages of the GLM floor plan App? Menu function for overview of a project. Floor plans can be created, sorted and deleted. 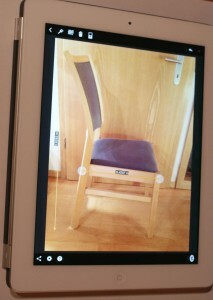 For further information on the GLM floor plan app. We plan to also review this app. Do you remember that we mentioned the users of Windows PCs? They do not benefit from Bluetooth and the Bosch GLM 100 C rangefinder. 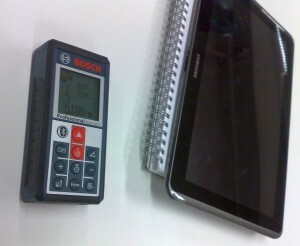 Bosch Professional Tools decided that the transmission of data to the PCs will be done via cable. Sounds pretty good, but is it practical? 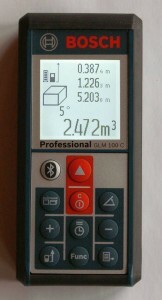 To be able to upload the results of measurements from the range finder to a computer via a USB cable, you must first install the application GLM Transfer Software. You can download it for free from the manufacturer. It is a tool that connects to a rangefinder, retrieves data from it (the results of measurements with units and the dates and times of measurement) and allows you to save your data in a spreadsheet or text file. With this application, we can easily edit the data and create measurement reports. That’s pretty cool, but why is the transfer limited by the communication cable? You cannot simultaneously measure and transmit data to a computer. First finish measurements and then send the results stored in the EDM. The limited memory of 51 records is a reason why an online broadcast via USB cable or Bluetooth would be very helpful. The integrated memory may be enough for measuring an inventory of window and door openings in the average size of a single family home but what about bigger buildings? Moreover, in this mode you need to do a sketch of the measured objects. Later on your computer you still need specific records to identify and assign the appropriate elements measured in the field. The Bosch GLM 100 C rangefinder with Bluetooth is the first model of the manufacturer Bosch, which is certified to ISO 16331-1. This document confirms that the instrument parameters – range and accuracy – have been tested according to strict standards (in certain lighting conditions, at a specific ambient temperature and for a specific color and surface). ISO 16331-1 helped to standardize the method of testing rangefinders. According to Bosch’s promises the new rangefinder measures distances up to 100 m with an accuracy of ± 1.5 mm. The laser rangefinder Bosch GLM 100 C has a tilt sensor. There are more middle class rangefinders on the market that offer this feature. Much more important is the one detail that distinguishes the sensor used in the Bosch GLMs from competing solutions. The Bosch inclinometer operates in two planes – a parallel and perpendicular to the instrument’s display. The scope of work in the X-axis inclinometer (left / right) to 360 ° (4 x 90 °), and the Y-axis (front / rear) – ± 60 °. The angles are determined with an accuracy of 0.2 °. What are the benefits of this? Wide range of measuring vertical angles in the X (360 °) allows to enter the menu rangefinder features indirect measurements. The classical theorem of Pythagoras is supplemented by the theorem of sine. This latter feature allows you to determine the height of the building, eg by measuring two distances – the upper and lower edges of the building – and measured between the points of the vertical angle. There is no need to keep the device in a horizontal position with the inclinometer. 60-degree range inclinometer measures in the Y-plane. This mode is used when the rangefinder Bosch GLM 100 C is mounted on the optional aluminum rail Bosch R60. Then the laser rangefinder serves as the control panel of a classic electronic level. The screen automatically switches to the measuring mode angles. Measured values can be angles in degrees, percentage or mm/m. The rangefinder emits a sound signal in positions 0 ° and 90 °, which for example helps to level the furniture without having to control the tilt. The manufacturer warns however, that when using the distance measurer with the rail may cause interference in the Bluetooth transmission. It is the end of turning heads when reading the results of the rangefinder’s screen. The Bosch GLM 100 C with Bluetooth, like its predecessor Bosch GLM 80, has a flip function that rotates the screen when you turn your rangefinder. This function works in both modes as rangefinder as well as in cooperation with the rail R60. Thanks to this screen reading the results is very convenient. The screen size is really large and the messages are clear. 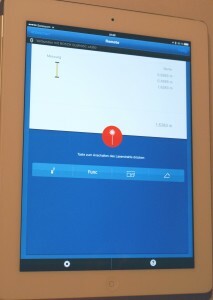 The backlight turns on automatically by using a light sensor. The automatic mode can be switched off. Bosch GLM 100 C is the second laser rangefinder on the market (along with its predecessor – model Bosch GLM 80), which is powered by a lithium-ion battery. Recharging through a mini USB port lasts 3 hours. The system of Li-Ion battery is at the moment the most efficient source of energy for measurement tools. Lithium-ion cells are deprived of so-called memory effect. They can therefore be recharged without having to worry about losing the nominal capacity, which in the case of Ni-MH or Ni-Cd batteries is not as obvious. The life of a lithium-ion battery is much longer than the one of a nickel-metal hydride or nickel-cadmium battery. 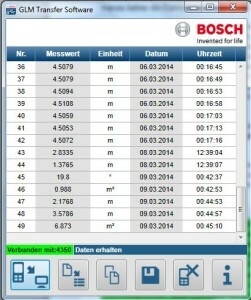 On a single battery charge the Bosch GLM 100 C will do about 25’000 measurements. Any laser rangefinder powered by conventional batteries cannot beat this result. Opponents of Li-Ion batteries argue that this is power system is missing flexibility. If you run out of energy in the field, you cannot remove the batteries and replace them with backups. It should be kept in mind that the Li-Ion battery can withstand several thousand charging cycles, which translates into a few years of stress-free use.